The sleep was again severely interrupted by the heavy blows during the switchovers. In the morning we could again note the loss of multiple wine bottles and the injury of one of our serving Negroes who had been thrown against the wagon wall by the impact. We had barely left Chicago on the Michigan Central Railroad towards our next destination, the Niagara Falls, when we entered the territory of the states of Indiana and later that of Michigan. Near Detroit we crossed in the railway train the Detroit river on a large traject ship. The Detroit River connects Lake Huron and the smaller Lake St. Clair with Lake Erie. And we finally reached at Windsor the territory of the Canadian province of Ontario. The day was beautiful and the area quite charming as forests and forest lots alternated with farms, fruit gardens and fields. The trees were already bearing their autumn dress that was much more intensively colored than in our hemisphere and showed itself in the numerous oak and maple trees in a remarkably beautiful red varying from a light vermilion to a dark crimson and effectively contrasted by thee yellow and brown of the poplars and chestnuts. The fruit tress, among them a scarlet Ailanthus, were bearing fruits. Despite these pretty images of which we could never see enough, I regretted not to spend the 4th October as usual high up in the Carinthian mountains in order to breathe clear air in my small hunting lodge and to enjoy pure nature, surrounded by the calling deer and hunting boys and bloodhounds and let the eye glance upon the incomparable landscape of our Alps. Man is thus devoted to his habits and misses what he cherishes. The sudden stop of the train tore me out of my thoughts and everything shouted: „the Niagara, the Niagara“. The railway administration had arranged a stop of a few minutes to allow the travelers a view upon the fall that disappointed and disillusioned me in the first moment. Since my earliest childhood I had imagined this natural wonder that stood in stark contrast to its reality. The river falls in a completely flat area out of which rise cities, hotels and smoking factory stacks from a rocky ledge that is quite similar to a giant dam. Nevertheless I can not deny that this mightiest waterfall of the world has a quite great character that however loses much in my eyes by the absence of a scenic landscape. The dignified frame is missing in this picture. The Niagara River is the outflow of the Lakes Superior, Michigan, Huron and Erie and descending on its 58 km length by 100 m it develops a torrential velocity. At the edge of the fall the river bed is split by Goat Island and thus two falls are formed, namely the 322 m wide American and the 915 m wide crooked Horse Shoe or Canadian fall. The border between the United States and Canada passes straight through the middle of the Horse Shoe fall. Both falls together send 425.000 m³ water per minute downriver. Below the falls the river narrows and forms roaring rapids that one can watch from the high Cantilever Bridge of the Michigan Central Railroad, a freely suspended bridge that crosses the Niagara without any supporting pillars. About 90 m further downstream the Railway Suspension Bridge hangs suspended, a chain bridge that also carries below the railway tracks another bridge for the road traffic. The train stops after having passed over the cantilevered bridge into American territory outside of the city of Niagara Falls that owes its existence to the foreign tourists and not to the few industrial establishments. Every year more than 400.000 visitors are coming here. Soon we reached Queen Victoria Niagara Falls Park on the Canadian shore that, well tended with lush green lawns and ornamented with mighty trees, follows alongside the river for about 4 km and offers everywhere splendid views on the falls. Table Rock is the point from which the Horse Shoe Fall makes the most dramatic impression. With a deafening noise the water masses crash down while the fine water mist in which the sun weaves gorgeous rainbows is twirled up highly. In a nearby house one receives a rubber dress that only leaves the face uncovered. Then one drives with an elevator down to the foot of the fall, passes first through a cave and then walks on a narrow runway between the rocks and the thundering water masses. It was a strange I might say constricting feeling to be in the midst of the roaring water and the rock wall. Our voices could not overcome the enormous noise. From time to time we received a douche coming down from a considerable height. The rocks here consist of sandstone and a very crumbly slate that was continuously shedding larger pieces so that the sense of security was much weakened while walking. On steps and ladders and frequent glitches on the slippery rocks we go down another 30 m, and came again in front of the fall and could again enjoy the greatness of the spectacle greeted by another extended water baptism. Very effectively the rays of the setting sun produced a magic reddish illumination of the fall. My name day was celebrated during dinner in the wagon and we then wanted to enjoy a pleasurable evening in the much praised Niagara Falls Music Hall. But the art on display was quite mediocre and the audience too of the lowest sort. ANNO – on 04.10.1893 in Austria’s newspapers. The k.u.k. Hof-Burgtheater is playing the comedy „Landfrieden“. The k.u.k. Hof-Operntheater is performing „A Santa Lucia“ and other pieces. Dieser Beitrag wurde am 4. October 2018 von wordpressadmin in diary veröffentlicht. Schlagworte: Canada, Niagara Falls, October, Ontario, sightseeing, train. On the line of the Denver and Rio Grande Railroad we were rolling towards our next destination, Colorado Springs, after we had turned Eastwards at Provo City. As far as the landscape is concerned, this route has to be described as very interesting as the tracks cross a great number of splendid canyons. Narrow rocky valleys and gorges exist in Europe too but neither in such numbers and extent, nor showing such grotesque formations we were encountering here. Unfortunately, the bad weather spoiled our enjoyment of the scenery as it was snowing when we passed the wild canyon of the Grand River and dense flakes and masses of fog covered the mountain peaks as well as the higher wall some of which rose almost vertically up to 750 m.
In many places the gorge with its rocky walls is so narrow that the railway and the river have just enough space next to each other and daylight can only enter between the colossal jagged walls. Nevertheless crippled pines have set root in crevices and wherever there is a bit of earth between the rocks, intensely red and yellow colored bushes peek out. The sandstone rocks appear in the most adventurous forms, withered and crumbled parts alternate with deep long clefts and caves. One expects the overhanging walls and blocks to tumble down into the abyss at any moment. Down there the gushing river digs its bed deeper and deeper. Rocks that have been broken off by the force exerted by ice in places pile up to mighty masses enriching the gorgeous view that this wild romantic and dark area offers. The Canyon of the Grand River is 27 km long until the valley in which much new snow was lying opens up without however losing its bare and rocky character. Whenever the fog was broken up by the current wind, we could also see the high mountains surrounding the canyon. Soon we entered into Eagle River Canyon that resembled its predecessor but was still considerable narrower so that one can not look up to the walls even from the bottom of the wagon. Here too some narrow tunnels had to be dug even though the railway tracks follow the river shore closely. Like glued to the wall appear the small huts of the miners and the mine entrances that allow the extraction of the ore and are the main source of income for the thinly distributed population. When we reached some sort of high plateau after having passed Eagle Canyon, we were received by light rays of the sun emerging from dense snow clouds. The rays illuminated multiple green fields, an unexpected sight. Grazing cattle and horse brought life into the landscape. The two cities of Leadville and Salida were examples of the already repeatedly observed type of urban settlements even though the territory, like the whole of Colorado, had been Mexican for a long time before it had been annexed by the United States. Numerous mountain names remind of this past era, thus the snow covered Sangre de Cristo range and places like Pueblo, which we later passed. Right after Salida we observed mighty round boulders that sometimes were piled up on top of one another that, individually, were larger than a small house. The vegetation here was very paltry and only represented by the roof-shaped dwarf spruce and cacti in yellow bloom. As far as greatness is concerned, the latest of the canyons, the canyon of the Arkansas, is the equal of the Great Canyon in the Yellowstone Park, but it lacks the latter’s splendid light and color effects that delighted me. Instead the canyon of the Arkansas is marked by the jaggedness of the red sandstone as well by the quite amazing height of granite rocks. The rocks rise at the most narrow spot of this 13 km long pass, called Royal Gorge, up to 800 m.
Overwhelmed by the view I stood on the platform of the wagon, following the example of most other passengers, while the speeding train seemed to flee out of the area of the threatening gigantic masses. Such scary areas have certainly been imagined in our mind while we listened to accounts of Indian attacks on trains, of fights between them and the passengers and of other romances about the far West with all their ghastly elements. Suddenly, and without any continuing spurs of the surrounding walls, the narrow valley stops and makes way to a wide prairie-like valley where timid trials of cultivating fields and fruit can be observed. From Pueblo the railway turns North towards Colorado Springs, a spa town popular due to its healthy climate where we rested for the night in order to drive to Manitou the next day and climb Pike’s Peak of 4331 m altitude. ANNO – on 30.09.1893 in Austria’s newspapers. The k.u.k. Hof-Burgtheater is playing the comedy „Der Veilchentreffer“. The k.u.k. Hof-Operntheater is performing the opera „Die Afrikanerin“. Dieser Beitrag wurde am 30. September 2018 von wordpressadmin in diary veröffentlicht. Schlagworte: Colorado, September, train, United States, Utah. The train led on a branch line of the Northern Pacific Railway in a Southeastern direction across a bare and sad area, through uncultivated hilly terrain and only in the distance the peaks of the Rocky Mountains were visible. Everywhere we saw cattle in great numbers that seemed to be well nourished despite the poor soil. One and a half hour before Butte City the land turned mountainous. The train crossed deeply cut valleys and gorges on tall wooden bridges. Numerous round rock blocks of considerable size were laying around everywhere allowing only sparse tree growth in the few open places. At many points we could see clear signs of mining that is very actively undertaken in this Rocky Mountain district rich in ore and centered on Butte City. This mining city in the purest sense of the word is situated in a bare valley surrounded by mountains and is recognizable from afar by its smoking stacks. In the middle of the surrounding area of the city rises a hill rich in ore whose copper and silver deposits are extracted by several mines. The attached machine houses, various laundries and large heaps of dead rocks covered the surface of the hill. Small tracks on which wagons and sledges with the mined ore moved led from site to site. Everywhere there was smoke, hammering and knocking. Around this hill are arranged the city and some settlements that have in time become suburbs, so that Butte currently has 40.000 inhabitants. If American cities in general are known to have been built without taste and present a chilling sight, then Butte City must count to be among the worst. One should imagine a community of a considerable extent where not one tree, not one spot of green, the motley houses are built on clay or sand and in the more distant roads are reminiscent of gypsy wagons. Everywhere the Non plus ultra of tastelessness is achieved. The roads are bumpy like a miserable country road. And still there are millionaires living in the city but they do not indulge in any luxuries here and do not embellish their sad homes and only amass dollars. A dense network of wires extended over the roofs and bright boards with obtrusive ads covered the front and side walls of all buildings. In a two-hour tour I have never receiver viler impressions than here but am still satisfied to have seen Butte City as my opinion that one has to see for oneself and not let one’s judgement be formed only by descriptions was confirmed once more. I was interesting in visiting one of the mines and thus I drove to a mine where I was informed that the officials and workers were at lunch and the mine at rest which made me conclude that a European shift organization that prevented the interruption of the work flow was not possible to install in this „free“ country here. After longer discussions, one worker was ready to show us the mine which was said to go down 335 m and we entered as seven on a sledge intended for four persons. Fortunately we stopped already at the second level and, each equipped with a flickering candle, followed a gallery until we arrived at the work place after we had climbed over multiple ladders. Here the copper and silver veins in the rock were visible in a strange clay mass. Mining is done in terraces that lie one above the other and are supported by wooden pillars and as elsewhere, they do use plenty of the cheap wood here. The profit of the mine seems to be small as only 60 workers were employed and everything looked quite shabby. I thus refrained from visiting the likewise resting laundry and smeltery and returned to the station. Then started an extended period of shifting our wagons in which they were pushed together so forcefully that only their excellent construction prevented damage, as we often had had the opportunity to observe this. Light-heartedly we parted from Butte City and drove up to dusk to the South towards Salt Lake City through a bare valley with numerous small stations. Alongside the tracks numerous herds were mingling. Some beautiful light effects were produced by the setting sun in the mountains and compensated for the strong monotony of the area. ANNO – on 28.09.1893 in Austria’s newspapers. The k.u.k. Hof-Burgtheater is playing the comedy „Das Heiratsnest“. The k.u.k. Hof-Operntheater is performing the ballet „Die goldene Märchenwelt“. Dieser Beitrag wurde am 28. September 2018 von wordpressadmin in diary veröffentlicht. Schlagworte: Idaho, September, sightseeing, train, United States. As the mail still had not arrived on the morning train, I used the time up to the departure to Cinnabar to pay a visit to Captain Anderson, commander of the cavalry detachment stationed here in order to have a look at the menagerie he had assembled which was to be sent to Washington. Captain Anderson had sent me into a fit of despair the evening before when he assured me that he could have arranged for a permission to hunt some predators in the park if we had announced our wishes a few days earlier. How easy it would have been to kill one of those tin-loving bears! The captain was living in a nicely equipped log house and knew many interesting details about the affairs in the park. His squadron has a very demanding job as it requires many guards and patrols that mainly have to look out for poachers and who have to overcome many dangers given the audacity of the poachers. A poacher was just recently relieved of a nice pony that was standing near the log house. The menagerie was small but counted among it many remarkable pieces, thus a porcupine, a young buzzard, a badger-like animal unknown to me, three rather tame beavers that could be taken out of the cage and wandered around freely. In an iron cage sat a black bear that had been caught only a few days before and was to undertake a journey to Washington. Four delightful wapiti calves were totally tame, and came running on call, sniffing us curiously, while a fox fled into its artificial cave only to peek out of a tube with a cunning glance from time to time but immediately retiring at every approach. During the morning some caravans of „sour dough tourists“ arrived which refers to the families that move through and now out of the park with a fully packed wagon, with their children and their stuff. We had encountered several of them already on the first day of our tour. The vehicle, their baggage and the passengers showed clearly visible marks of their gypsy-like roaming. The way these nature lovers visit the park is without doubt a very strange one and a hardly comprehensible way for us to enjoy the summer time. Any demands for comfort these travelers may have to forsake, and whether they find compensation for their many deprivations of their exhausting journey in their boundless existence is dependent on the favor of hazard and the weather’s caprices and thus can not be predicted but seems to be the case. On the small square I then inspected a cavalry detachment, about half a squadron that performed exercises to an officer’s command. The troop exercised developments and movements that were a bit more complicated than those used at home. The development of a skirmish line where the carbine is grabbed while mounted seems to be one of the most important evolutions. The horses were noticeably tall, strong and also good, mostly white horses. The riding of the soldiers and the rough treatment of the horses I found less sympathetic. The riders wore standard dark-blue uniforms with yellow lacing on the pants and gray slouch hats and tall heavy boots. The armament consisted of saber, revolver and carbine. The latter and the saber were attached on the saddle. To Cinnabar we came faster this time than the outward journey as the route was in a better condition and was mostly downhill. In this place we had to wait for a long time for the departure of the train of the Northern Pacific Railroad which would take us to Butte City by the way of Livingston. We then intend to travel on to the center of Mormonism, Salt Lake City, our next destination. During the waiting time in Cinnabar we spoke with an old Saxon who had run away from his homeland to lead a free life in America as a hunter and trapper that apparently pleased him very much. Currently the man engages in a very brisk trade in bear furs and fossilized wood. With special enthusiasm he told us from his hunting expeditions on which he shoots the game emerging from the park but became very agitated when I asked him whether he was married and professed himself as a confirmed bachelor (Hagestolz). Due to a happy coincidence, I was able to see the most audacious female rider of the area who is able to tame even the most intractable and wild horse, but has been quite neglected by nature as far as beauty and female grace are concerned. 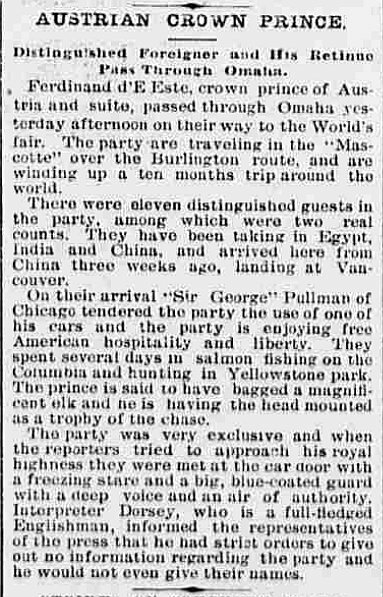 In Livingston we had to use our Pullmann Car also as our night’s lodging as the train to Butte City was only to arrive towards 4 o’clock in the morning. The former city is a known trading place for furs and hides. In the shops one may buy the following: puma, bear, wolf, fox, cat and marten furs, buffalo hides, numerous antlers among them capital ones from wapiti and black-tail deer as well as from mountain sheep. Furthermore a lot of Indian curiosities such as weapons, jewellery and various products of the local industry. The prices demanded by the merchants were completely outrageous. Furthermore we had to accept it as a kind of grace that they sold us the desired piece for our good money or even receive some sort of packaging. A simple Indian shawl cost 10 dollars, a badly stuffed buffalo head 600 dollars and a pair of wapiti antlers up to 200 dollars. Still our shopping craze was great as we had found many beautiful objects. When I sent two of my gentlemen with all the necessary attestations and certifications to the post master in the evening and asked him to hand out my mail here in Livingston that had arrived at almost the same time as we and was addressed to Mammoth Hot Springs Hotel, I had to experience another proof of American unfriendliness that was very detrimental for our mood. Even though the gentlemen also presented a letter from the post master at Mammoth Hot Springs Hotel in which he asked his colleague to hand us out the late-arriving mail which was just then laying on the counter so that individual addresses could be read and one could note that among the letters there were also some whose quick reception was important for me, the impolite post master did not want to give us our mail at any price and insisted to send it on to the place of address despite all our means used to change his opinion.Finally he put on his hat and left his office without a word. ANNO – on 27.09.1893 in Austria’s newspapers. The k.u.k. Hof-Burgtheater is playing the drama „Der Meister von Palmyra“. The k.u.k. Hof-Operntheater is performing the opera „Romeo und Julie“. Dieser Beitrag wurde am 27. September 2018 von wordpressadmin in diary veröffentlicht. Schlagworte: Montana, September, sightseeing, train, United States, Wyoming, Yellowstone National Park. The morning brought us a drive through a desolate area in which bare hills covered with yellow grass rise while the mountains whose peaks were glittering with new snow were only sparsely covered with trees. We saw only a few farms but instead quite frequently Indian of which one offered a whole group of polished buffalo and ox horns for sale at a station. Men and women had their faces tattooed red or chrome yellow, the hair braided and rings made out of shells in their ears. The dress of the men seemed to be a mixture of national and European pieces. It was not without a comical element to see a son of the wilderness who still wore moccasins and original leather pants but covered his body in a worn black jacket and his head with a crushed top hat instead of eagle feathers. The women were clad in colorful capes and stared at the travellers emerging from the train. What a difference between these Indians weakened by culture and their wild free and proud ancestors who not long ago were the masters of this land! In the afternoon we crossed for the second time the continental divide of the Rocky Mountains, this time at Mullan Pass, through a one kilometer long tunnel at an altitude of 1691 m above sea level. The crest of the mountain range rises to 1789 m. The contrast between the Western and Eastern side of this watershed is remarkable. The yellow ledges of the Western side are replaced by a broken rock landscape in which the railway twists its way up by important bends and sharp curves. The rocks appear not seldom in fantastic forms. The vegetation leaves much to be desired both in the West and the East. A short time later the train dashes over a sort of high prairie, a very wide flat valley; a mountain range on whose peaks lies much snow rises steeply. Half-wild cattle herds ran around on the prairie and the locomotive driver often had to use the steam whistle in order to chase the animals from the tracks. Numerous carcasses of dead pieces are bleaching on both sides of the tracks. As the territory is very rich in ores especially in gold, we saw a lot of mines around which settlements, called cities, were grouped among which Helena is the most important and the capital of Montana. Around this place that reminded me of Spokane are rich gold and silver deposits in quartz stone, besides copper, iron and lead. With considerable delay that is almost regular on American railways we arrived in Livingston where we passed the night in the wagon as no night trains were allowed to move on the smaller lines, so that one is forced to spend the night either in a hotel or in the sleeping car. ANNO – on 20.09.1893 in Austria’s newspapers. The k.u.k. Hof-Burgtheater is playing Schiller’s tragedy „Die Räuber“. The k.u.k. Hof-Operntheater is performing the opera „Carmen“. Dieser Beitrag wurde am 20. September 2018 von wordpressadmin in diary veröffentlicht. Schlagworte: Montana, September, train, United States. Early in the morning close to Fort Shepherd we crossed the border between British Columbia and the United States and are now on the territory of the state of Washington. In the morning the steamer moored at Northport, the final destination of our river journey. As there existed a wise custom of letting a train depart only on those days that there was no steamer, I was forced to take a special train that consisted only of the machine, baggage wagons and a Pullmann salon wagon. I just then rented the latter one for the full journey onward. This wagon had a kitchen, comfortable sleeping spots and offered the advantage that we could hope to stay among ourselves and thus be spared to come into contact with unkind fellow passengers. The transfer from the landing to the station at Northport is strange as the track runs straight into the river. The steamer moves so close to it that it is beached. The train literally drives into the water up to half its axis height. The traveller thus takes a big step from the ship to the train wagon while tiny fishes are swimming around the steamer and the train. Our baggage was quickly loaded into the train and now the journey went very quickly, despite the construction of the Spokane Falls and Northern Railway not inspiring much confidence, alongside the steeply falling lake shore to Marcus where the train leaves the lake behind and turns towards Spokane. The landscape here is markedly different than that of the day before. Not very tall pine trees growing at considerable distance from each other. The ground is covered by dry yellow grass. Instead of the earlier so numerous burnt places there are here corn [maize], oats and wheat fields. Close to the farms herds of beautiful cattle and studs of well formed horses are cavorting. Noticeably many steam saws lay next to the tracks and giant stacks of cut and planed boards prove that here the value of wood is much appreciated. The possessions of the individual farmers were enclosed by barbed wire. We saw some game too as from smaller lakes and reed covered ponds rose flocks of ducks into the air an flew swift as an arrow past the windows of our compartment. Already in Northport I had received a telegram from Colonel Cook who asked me to his regiment and camp located near the city of Spokane as there would be a two hour stop in that place. I thankfully declined this somewhat strange invitation in consideration of my incognito which led to a vituperative article in the Spokane evening newspaper that was handed to us in the wagon. The article had the laconic title „Franz is here„, illustrated with my image and was filled with mean falsehoods that did in no way attain their intended goal of offending me. To the contrary, I found this old canard only ridiculous all the more so as various parts were unintentionally funny. Thus, for example, the bad tempered reported exerted himself about our too numerous pieces of baggage and posed the question how this would be after I had been married . Then he criticized the „nonchalant“ knocking off of the cigar and other nonsense of this kind. Instead of attending the parade I used the stay for a visit of the city of Spokane whose tasteless buildings painted green or red presented a not so pleasing sight. The center of a rich agricultural district, Spokane was founded in 1878 and rebuilt after a great fire in 1889. Traces of the latter can still today be perceived in the city center. The streets were full with an extraordinary amount of droppings, a situation that reminded me of small villages in Eastern Europe (Halbasien). The two waterfalls within the city, Spokane Falls, are praised as natural beauties but are actually only weirs from which the water drops out of a total height of 45 m and which powers an lighting system numerous factories and other enterprises in the vicinity. After a two hour stay out wagon was coupled to the main train that was fully packed with passengers despite its length and the journey onward started on the Northern Pacific Railway. 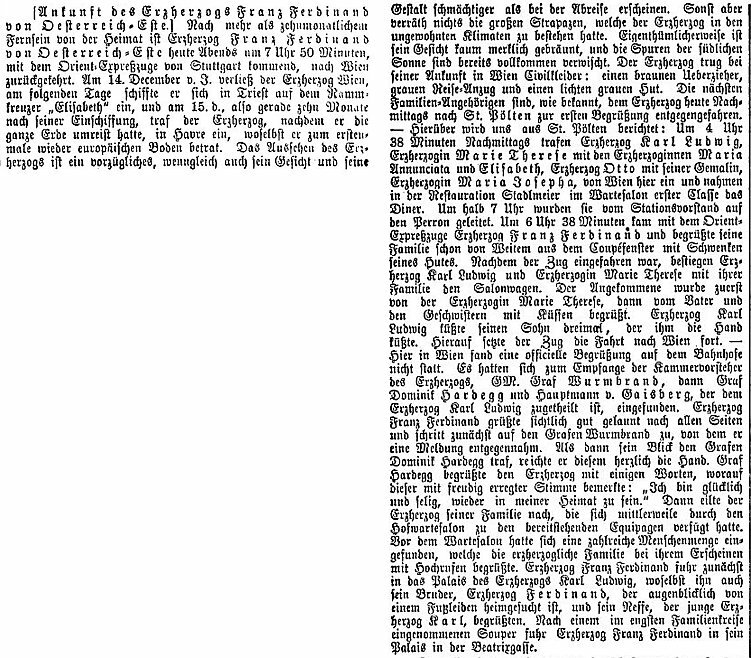 ANNO – on 19.09.1893 in Austria’s newspapers. The k.u.k. Hof-Burgtheater is playing the comedy „Wilddiebe“. The k.u.k. Hof-Operntheater is performing the opera „Der Templer und die Jüdin“. 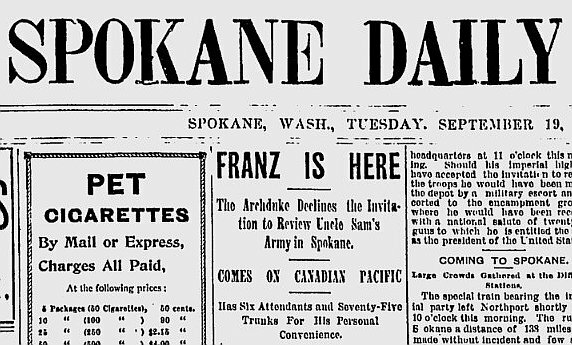 Spokane Daily Chronicle 19 September 1893 article „Franz is here“ [PDF] (Source: Google News archive link) – The actual article can in fairness not be called vituperative and is mild in comparison to other US newspapers who called him a „boor“. See also: C. S. Kingston: Franz Ferdinand at Spokane—1893, The Washington Historical Quarterly, Vol. 16, No. 1 (Jan., 1925), pp. 3-7 (available via JSTOR). Dieser Beitrag wurde am 19. September 2018 von wordpressadmin in diary veröffentlicht. Schlagworte: Northport, September, Spokane, train, United States. During the night the rain stopped again. A fresh wind coming from the mountains brought beautiful if cold weather. As it was Sunday today, there would be no train today and I only managed to get a special train thanks to the outstanding courtesy of the railway administration. The train was set to depart at 3 o’clock in the afternoon. Up to then, I stayed on board due to the cold I was still afflicted with, while my gentlemen undertook an armed promenade to the heights situated above the station and returned with some grouses of a smaller species. Later we tried to fish with rods but remained mostly without success even though some Englishmen we had observed at the same spot the evening before had caught beautiful salmon trouts there. In the special train that consisted of two sleeping cars and a monster of a locomotive we were greeted friendly by smiling Mr. Fisher, a mulatto who had served us already during the railway journey from Vancouver. We flew through the already known pretty region towards the main line which we reached at Sicamous. About an hour before this station the railway comes close to the shore of a bulge of Shuswap Lake, that lies elongated and earnest between dark forests. Only a bark canoe steered by Indians, some individual great loons and now and then a flock of ducks were to be seen on the smooth surface of the lake. New snow that had fallen during the night covered the mountain ridges. The bleak fir trees looked quite delightful in their white dress that they probably put on the first time in this year. After Sicamous station we soon turned away from the lake shore into a densely filled forest landscape that is criss-crossed in many bends of the small Spallumsheen River. It is pleasant to see large stretches of forest here that had not yet been touched by fire. The sunset brought a surprise, namely a kind of alpenglow, I had not seen before during this week and which was incomparably beautiful. In an otherwise cloudy sky the heights were glowing in the most intense red that bled into a purple at the lower end and stood out sharply against the already shadowed parts of the forests, while the snowy peaks were tinted in light pink. This gorgeous color effect lasted for nearly half an hour. 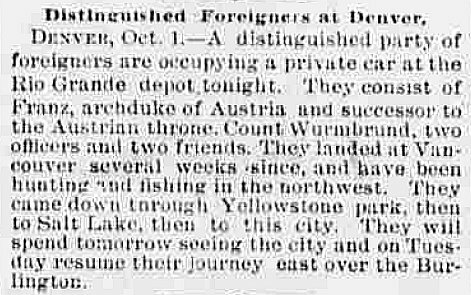 Late in the evening we were in Revelstoke where we left the wagons and embarked on the river steamboat „Columbia“ owned by the Columbia and Kootenay Steam Navigation Company. With it we would drive down on the Columbia river in order to take the railway again at Northport that would transport us to our next destination, Yellowstone Park. „Columbia“ is built according to the same system as „Aberdeen“ only bigger in all its dimensions so that it could take in up to 100 first class passengers. But it seems to be quite old and in need of repairs, as everywhere it was posted that the life-belts were to be found under the beds in each cabin. In my cabin I discovered that I could look through yawning gaps in the ship’s side while it directly rained through the deck on the bed of one of the other gentlemen. ANNO – on 17.09.1893 in Austria’s newspapers. The k.u.k. Hof-Burgtheater is playing the comedy „Die Welt, in der man sich langweilt“. The k.u.k. Hof-Operntheater is performing the opera „Manon“. Dieser Beitrag wurde am 17. September 2018 von wordpressadmin in diary veröffentlicht. Schlagworte: Canada, September, train. Awakened and looking out of the window of our compartment we saw that the countryside had taken on a different character: our eye was no longer looking upon giant mountains and glaciers but glanced over rolling low mountain ranges, long-winded densely wooded ridges above valleys in which wood lots alternated with cultivated areas and numerous farms demonstrated a certain level of wealth in this region. Various lakes enlivened the view all the more by the presence of game, namely geese, ducks and grebes. If one may call the Rocky Mountains as romantic wild then this landscape deserves the commendable epithet „delightful“. Unfortunately we could not enjoy this sight for long. Soon the forest grew more sparsely and dry yellow grass covered the bare looking slopes. We still continued to drive past many lakes but missed the fresh green that we had earlier found so congenial. In Sicamous we switched onto the tracks of the only recently opened branch line of Sicamous to Vernon. The latter final station is situated at Lake Okinagan that extends similar to a river for 121 km in a Southern direction across the land. At Priests‘ Landing we changed from the carriages to the wild stern wheeler „Aberdeen“. Our cabins were on its upper level. The vehicle is also owned by the Canadian Pacific railway and it achieves a speed of 12 knots if it is only burning wood. „Aberdeen“ started moving, its mighty wheel stirred the water masses and we steered out onto the lake that was smooth as glass. The day was gorgeous. The sun was shining upon us and provided pleasant warmth. The especially clear air allowed us to distinguish every detail on both shores of the not very broad lake. The surrounding low mountain range was only sparsely wooded, partly in large areas that are said to be in a luxurious green in spring but now were covered with yellow grass. Numerous herds were grazing on the slopes. I could unfortunately not enjoy much of the beautiful journey. I was feeling unwell due to a severe cold and thus had to lie down in my cabin during most of the journey. Only from time to time I managed to catch a glance of the surrounding area through a small window. The journey took six hours to Penticton at the Southern end of the lake. There soon would be constructed a railway connection to the North Pacific railway of the United States but in the mean time there is only demarked the space of the future station and a wooden hotel is under construction. With respect to the projected railway construction and the predicted rapid growth of the future „town“ of Penticton the Canadian Pacific railway company already offers now a daily connection by steamboat albeit at a loss only in order to uphold the first mover right of shipping on Lake Okinagan and pre-empt any potential competitors. At the moment only rarely does a passenger use the line, most often a hunter or squatter. On our journey too we had only two fellow passengers. The American entrepreneurial spirit does not shy away from spending important sums if profits can be expected in the future. Until late in the evening everything for our planned hunting expedition to the Gold Range was discussed, determined and prepared. ANNO – on 11.09.1893 in Austria’s newspapers. Empress Elisabeth is currently staying incognito as „Countess Hohenems“ in Venice’s Hotel Europa while her husband the Emperor is visiting Hungary. The k.u.k. Hof-Burgtheater is closed for summer until 15 September. The k.u.k. Hof-Operntheater is performing the ballet „Die goldene Märchenwelt“. Dieser Beitrag wurde am 11. September 2018 von wordpressadmin in diary veröffentlicht. Schlagworte: Canada, September, train.